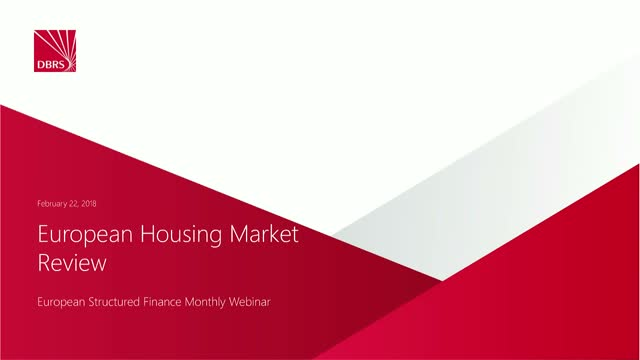 DBRS Ratings Limited (DBRS) invites you to attend a webinar on European Housing Market Review on 22 February 2018 at 3 p.m. GMT/4 p.m. CET/10 a.m. EST. The webinar will be hosted by Gordon Kerr, Senior Vice President and Head of EU Structured Finance Research, Asim Zaman, Vice President Global Structured Finance and Jason Graffam, Vice President of Global Sovereign Ratings, in London. The discussion will focus on housing markets within select countries in Europe. Starting from a macroeconomic perspective, the presentation will then explore DBRS views on a number of housing markets and their drivers.